Rain School highlights some of the struggles that children face in getting an education, as well as the great lengths that people will go through to go to school - even if involves building the school itself! The story was inspired by the author's own experiences in Chad as a Peace Corps volunteer. 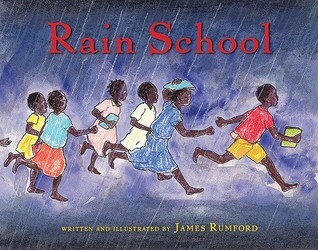 Rain School is a bit of a circular story, which makes it an ideal candidate for studying the importance and interrelationship of beginnings and endings. The story opens with the first day of school. "In the country of Chad, it is the first day of school. The dry dirt road is filling up with children. Big brothers and big sisters are leading the way." Children can easily imagine themselves in this situation, due to the familiarity of experience first days of school, and this connection is drawn out by the constant questions young Thomas asks as he walks to school for the very first time. The big twist is revealed on the third spread, "Thomas arrives at the schoolyard, but there are no classrooms. There are no desk. It doesn't matter. There is a teacher. 'We will build our school,' she says. 'This is the first lesson.'" The story continues from there and documents the process of building the school and some of the lessons that the children learn. The last day of school coincides with the beginning of the rainy season, and the strong winds and heavy rains demolish the mud brick school. The story then ends, back where it began. "Come September, school will start over. Thomas will be a big brother then, leading the children on their first day to school. They will all stand in front of their smiling teachers, ready to build their school again." As the end-is-the-beginning concludes, it helps students to see the impact and importance of this yearly process and how hard these children work for their education. Powerful stuff. Wow, that sounds like a powerful read! Kids and schools in the U.S. these days tend to be so product-focused, so this is an especially important story for them to hear I think. Thanks for sharing! Agreed, Laura. I always think it is helpful to give kids a broader sense of perspective! Whoops, thanks Juliana! Clearly this post-a-day thing is beginning to take its toll. :) Fixed it. I absolutely agree with you that kids need to realize all the opportunities that they have on a daily basis. I love it! Education in other parts of the world is seen as a great privilege. It sounds like this story definitely drives home that point. I love books that take you on a full circle journey! I'll have to check this one out! Thanks, Lindsay. Education is a privilege, and this is a great book to help students appreciate that point. Katie, another great choice! I love your analysis of beginning and endings. You make it clear how the story is circular and comes right back around. Now I have a better idea when I am ready to do a post with that element. Glad to help, Joyce! Not every story is circular, of course, but you always want some connection to the beginning when you reach your end, and it is magical to see how great books accomplish that. And here are two more examples. This looks like a book that belongs in every school library. The message is powerful, and in the circular structure the determined pursuit of education is emphasized as the ending becomes a new beginning. Great review Katie! Thanks so much! It really is a book for opening kids' eyes. Thanks, Vivian! I think is one would work as a great mentor text for kids too, because the circular structure of the story matches a circular structure (seasons/years) that makes sense to kids. Yes, I've read this one. It's a good one. Checked it out multiple times. Katie, you have a knack for picking out these great books that weave right into your site's purpose. So curious to see what other great books you've picked out. Yes, the daily blogging is hard. I'm glad it don't blog daily year round. Two weeks is plenty, but it's lots of fun! Thanks, Christie. I'm normally on a two-to-three times a week schedule, but daily definitely means the typos can pop through. Glad you are enjoying my book selection, and I am really enjoying hearing everyone's thoughts and analyses too! This book gives children (and adults) a tiny glimpse into someone else's "real world", one that is not as easy as ours and might give our children a deeper appreciation for the school life they have.